Manufacturer of a wide range of products which include self adhesive sticker film. We have become popular among all our national and international customer by offering anexclusive range of paper and film adhesive media. These are checked on different parameters by ourteam of professionals to ensure excellent toner fixing on all brands of digital color printers. The qualityof adhesive used gives excellent adherence to any surface like paper, wood, metal, glass, acrylic surface.Our comprehensive selection availability for clients from any industry. 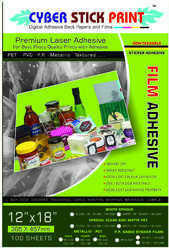 Looking for Adhesive Film Media ?